Thanks to my high ranking in search engine results for "panera asian sesame dressing recipe", I'm up on all the latest developments in America's never-ending quest to duplicate Panera Bread's Asian Sesame Chicken Salad dressing at home. Recently, commenter Mellannie noted that she found the dressing, bottled, at SuperTarget. So I went to our local SuperTarget and checked for myself, and sure enough, there was the bottle, right in the bagged salad section as Mellannie had said. Price: $4.49. My name is Jon and I’m working with California Pizza Kitchen to help promote their new Small Cravings menu. I noticed on your blog that you’re a fan of CPK and I wanted to share this video we created that documents CPK diners’ first impression of the new Small Cravings menu. I’d like to invite you to visit CPK in hopes that you’d document your experience and write about your own reaction.. I can offer you $50 in CPK Dough so that you can head out to your local CPK on us. Well, hey: a paying gig. I imagine this came about because of this review I did earlier. So, I took Jon up on the offer; sure enough, after a couple of weeks, $50 in "CPK dough" arrived in the mail. Last weekend Amy and I went to CPK, and we ordered one of each item on the Small Cravings menu. That, coupled with the fact that I was photographing everything, probably had the waitstaff thinking I was some kind of Actual Journalist or something. 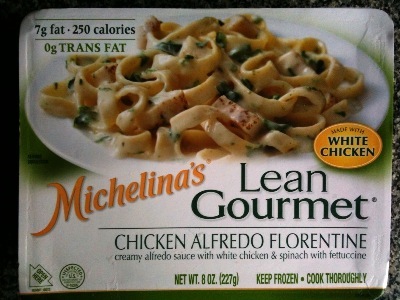 "Chicken Tenderloins in Alfredo Sauce with Spinach and Tomatoes over Whole Grain Penne". 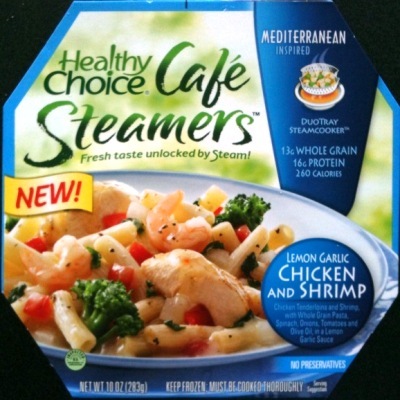 From the "Café Steamers" Mediterranean-inspired collection: "Chicken Tenderloins and Shrimp, with Whole Grain Pasta, Spinach, Onions, Tomatoes and Olive Oil, in a Lemon Garlic Sauce". 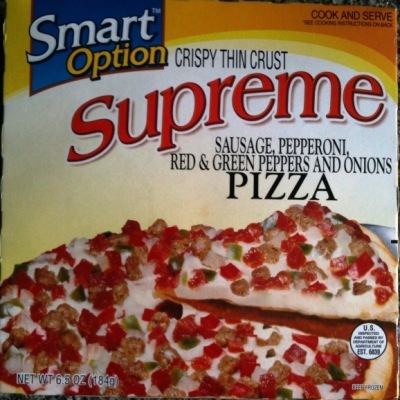 "Crispy thin crust SUPREME sausage, pepperoni, red & green peppers and onions PIZZA". 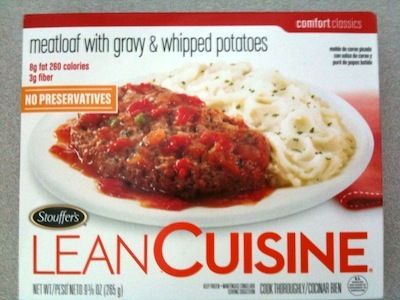 It's meatloaf. No other description necessary, I guess. Yeah. Until recently I didn't even know about sous vide cooking. My foodie friend Eileen gave me some well-deserved crap about it. 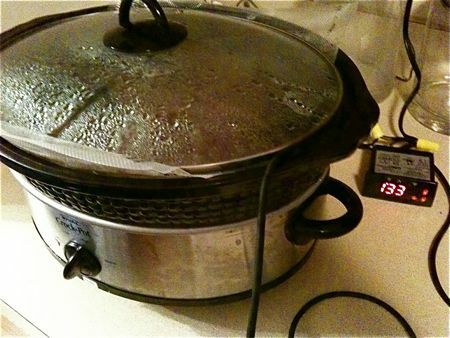 But now I get my revenge: I am doing my own sous vide cooking at home, using my $80 home-built contraption. How many people can say that? So I already had a vacuum sealer. That's half of this technique ("sous vide" means "under vacuum"). 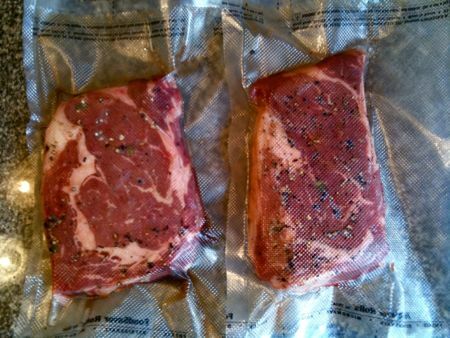 Here are a couple of steaks I vacuumed-sealed with a basic marinade (just lemon juice, Worcestershire sauce, and pepper). 132°F for a little over an hour, and then seasoned and marked on the grill. Here's the amazing result. 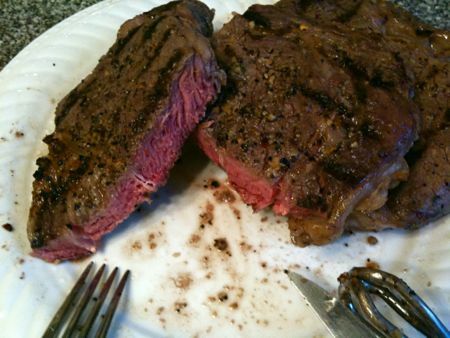 It's a perfect medium-rare, juicy and tender. It's fantastic and foolproof. I am a happy happy man. 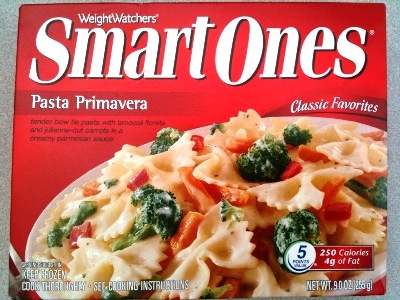 "Tender bow tie pasta with broccoli florets and julienne-cut carrots in a creamy parmesan sauce." 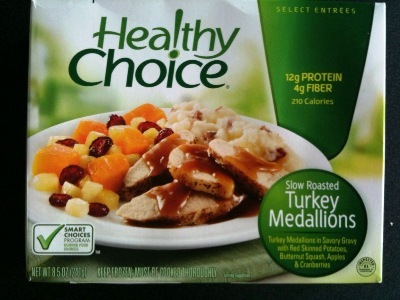 "Turkey Medallions in Savory Gravy with Red Skinned Potatoes, Butternut Squash, Apples & Cranberries." 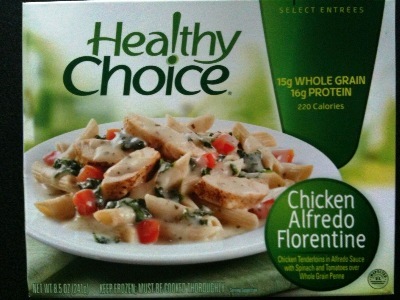 "Creamy sauce and pasta with broccoli and WHITE chicken." 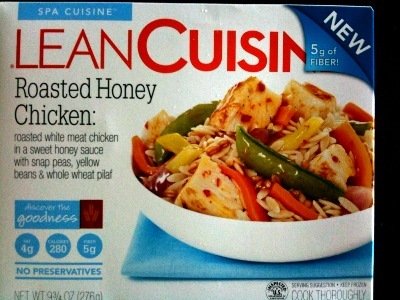 "Roasted white meat chicken in a sweet honey sauce with snap peas, yellow beans & whole wheat pilaf." Yes, a sweet honey, as opposed to that other kind. 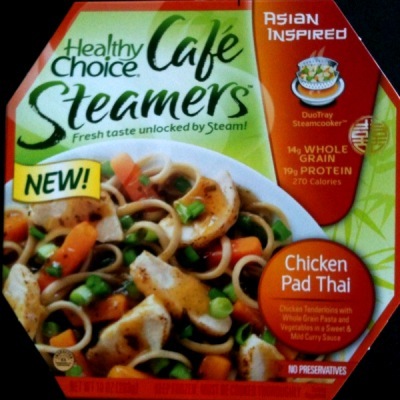 From the "Café Steamers" collection: "Chicken Tenderloin with Whole Grain Pasta and Vegetables in a Sweet and Mild Curry Sauce". 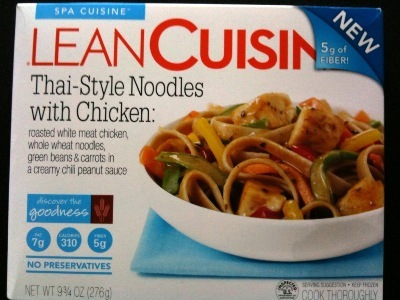 "Roasted white meat chicken, whole wheat noodles, green beans & carrots in a creamy chili peanut sauce." Is this new? 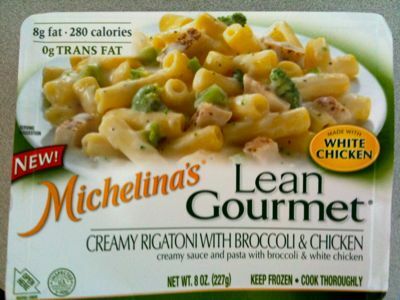 I didn't know Michelina had "lean" meals. "Creamy alfredo sauce with white chicken & spinach with fettuccine". Note the emphasis on WHITE chicken. Damn chicken racists.